The Cherry Kingdom is the ninth kingdom in Donkey Kong Jungle Beat. In the original version of the game, it is the first kingdom linked to the J Barrel and can be accessed by completing all the kingdoms linked to the K Barrel and collecting twelve or more Crests. In the New Play Control! version, it is the third kingdom linked to the J Barrel and is accessed by completing the Grape Kingdom. 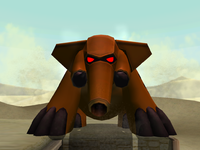 It is the dominion of Hard Roc in the Nintendo GameCube version of the game, or Grave Tusk in the New Play Control! version. At the end of every level, Donkey Kong eats a giant cherry bunch. Aurora Glacier is the first area of the Cherry Kingdom. Auroras can be seen in the outside portion of the level, hence the name. Donkey Kong has less traction on this stage and can easily slide across the icy floors. Ice Bakkies attack Donkey Kong here, causing him to freeze as well if hit. The stage also features some Helper Monkeys, who toss Donkey Kong to new areas. Although it appears to be very chilly in this level, Donkey Kong is able to swim in the underwater areas of it. Two mini-bosses are encountered in this level as well, and they include a set of two Coco Pigs, who throw coconuts and ice balls at the ape from trees, and a Rolling Frog. 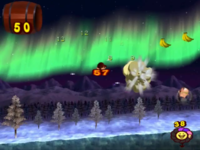 At the end of the level, Donkey Kong is able to bite into a cherry bunch to end the level. Grim Volcano is the second area of the Cherry Kingdom. There are several Fire Bakkies here and they will cause Donkey Kong to burn if they touch him. The lava in the level occasionally shoots a pillar of fire here as well, so Donkey Kong has to time his jumps correctly. Like most other levels in the game, Helper Monkeys and Banandelions appear, as do some meteors. Other returning obstacles include mushrooms that quickly grow when hit by sound waves and Dragon Slots that send Donkey Kong to new areas. Two new types of enemies also appear in this level. The first new foe is Tar Man, who blocks the ape's path into a small gap, and the final new enemy is Mini Panda. In the GameCube version, Hard Roc is faced. He looks like the other Rocs, but is colored a light grey. Hard Roc is fought in a setting much like the other two battles, but there is a larger stone column, Banandelions, and two Helper Monkeys. He attacks in the same way his predecessors attack, using their attacks as well. After he loses half his health, Hard Roc will gain the ability to fire three Shadow Meteors at once, as well as the ability to fire a shadow-like creature. 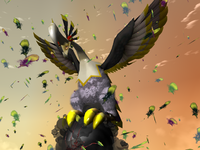 Once defeated, he will explode, and feathers will fall to the ground. In the New Play Control! version, Donkey Kong must face Grave Tusk, who looks exactly like Turret Tusk, but is colored brown. He is fought in a desert-like setting. After losing enough health, Grave Tusk gains a new attack: a laser attack that is fired from its trunk. When defeated, Grave Tusk will fall apart and deactivate, much like the way Turret Tusk is defeated. This page was last edited on April 12, 2019, at 13:14.